Conservatories are made using raw material from the start; a profile company manufactures the raw compound in the early stages of the process. Most of the larger companies are based in Germany; they have the highest standards of delivering the profile to meet client's requirements. There are a number of German manufacturers who export conservatories to England and the double glazing industry here. One of the companies that Essex Conservatories use is called Rhaul. Rhaul have been trading for more than forty years and they also supply thousands of other household products that most people have in their houses such as hosepipes in your garden. When the buyers in England order the profile it is bought in the profile state ready for the cutting machines. The profile is bought at five to six metres in length and is made in door window sach, this is complimented in cherry wood grain and light and dark oak. When the double glazing companies in the UK are supplied with their order, it is stored in a dry factory and left to acclimatise to let the material expand and contract. Once it has had time to breathe it is then ready to begin the process of being made into a conservatory. This machine consists of a twin headed saw with double blades that can range from 300mm to 400mm. The machine is designed for cutting the profile on the saw bed; the machine cuts the perfect angle, in fact any angle including compound angles. One of the main benefits of the double head is that the twin blades cut the profile twice at different lengths, thus saving time from using the more conventional one blade method. When the cuts are finished they are inspected by a highly qualified factory hand which is then sent to the next stage the corner welder. The corner welder is a very large machine that welds the pre cut corner made by the double headed saw (as mentioned above) to then be plastic welded .The machine is kept to a working temperature of over 100 degrees, the corners then enter the machine and two air clamps from the work bench hold the profile steady while the hot plate rises from the machine bed. When the hot plate reaches it maximum temperature the arms push the corners together. The corners are them married up for welding, they are held tight together while the heat fusion starts to happen. When they are fully welded and cooled off, the arms and clamps release and the machine pushes back the finished corner, this is then inspected by the factory hand. The internal corners are then cleaned by a moon knife, this is a sharp knife that is able to cut the profile in a cold state. After the main frames are made the transoms are then fully inspected for knifings off. This is a process where a flat piece of metal with a slit in it is placed on the corner that is welded and the highlights are taken off to around 3mm leaving a perfectly finished item. The process of this stage is to install the black gasket you often see in your own double glazing. We use the finest gaskets available; these are also used in aeroplanes around the world and are called neoprene. These are fitted in the rebate that is in the profile which is made in the early stages in Germany. The gasket is gently pushed in the factory completely around the profile and is cut at the end when the ends meet. The gasket is wind tested up to a speed of 140 mph and still holds back at this speed. The wind drafts all hold the British standard kite mark. There are two types of gaskets available, bubble and flipper, both of which meet Essex Conservatories standards. The window beads on Essex Conservatories are around the inside of the glass, this is called internally beaded and offers the highest form of security available. It is unlike the externally beaded windows that other window companies use as they are very easy to break into. Removal of these beads with a simple tool means any potential burglar can remove the glass with very little effort. At Essex Conservatories we only ever supply internally glazed windows to the public. One of the main factors to consider is the security of your windows and doors, this is paramount to our customers. You can be rest assured that at Essex Conservatories we only supply the highest specification for security on your doors and windows. We use the hook bolt system which is a system that has undergone the most stringent tests. This system was awarded the British Kite Mark so you can be assured that you have a product that has been quality assured. All the windows and doors are complemented with our range of stylish handles they come in a range of colours including white, gold, black and silver. At Essex Conservatories we can supply you with all the necessary glass you may have heard of. One of the very latest is k glass, this keeps out the rays from the sun that discolours your household carpets and furniture. The k glass keeps this ultra violet light out and keeps in the heat from the sun, this glass has been awarded the British Kite Mark. We always supply the customer with fully toughened glass, this is known in the industry as TX and is made on a 28mm unit. This comprises of a 4mm glass, 20mm spacer bar and a 4mm glass thus resulting in a 28mm unit. We can supply all types of glass i.e. smoke, mirror and ant tile affect. All of our glass units come with a 5 year guarantee from us and carry a manufacturers warranty giving you total assurance that you have a high quality product. At Essex Conservatories the roof plays a very important part in the installation process, we use only the best systems available on the market. With the benefit of the introduction of the very latest in glass roofs you have a wider choice available to you including glass that is self cleaning and which carry the BSI kite marks. The roof bars we use are made of ail which are very strong and durable, the cappings we use are made out of white plastic which is totally colour fast. It's very hard to visualise what your conservatory will look like outside, never mind inside. We now live in an age of technology where with the aid of computers we can bring this visual to life in the comfort of your own living room. At Essex Conservatories we are armed with the latest in computer design software and can custom design any conservatory in your home with a free estimate. We are able to show you your dream conservatory from out of the ground up to the last roof panel being installed. We build on the type of conservatory you require and we start to build it in 3D on our laptop screen. We appreciate that this is how you start to visualise what your conservatory is going to look like as an end result. The programme we use is used by architects and surveys for planning application to local councils. We are able add all types of different elements into the design, it has the capacity to put in all types of leadlight windows and panel doors and base rails, you can see some of our finished projects on our website. What you see is exactly what you will get, nothing is hidden. We have the ability to superimpose the conservatory on the back of your house as well, we are proud that Essex Conservatories can supply this to our customers. If you don't like the doors for example, then this is no problem, a touch of the button and like magic it's changed, if you don't like the bricks then this is no problem as we are able to change these too with a choice of over 200 types of bricks from the library in our software. The benefits of our system are second to none and that why we secure over 85% of our trade to the public. 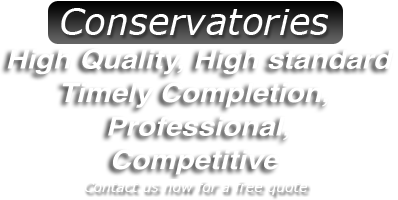 Call us today for your free Essex Conservatories estimate with no obligation. We offer this free service with a seven day a week phone number that stays open till 10pm including Sundays and Bank Holidays. We are totally committed to customer service. Here at Essex Conservatories we are so convenient that we will never be beaten on price. Should you receive a quote from another company we can guarantee that we will beat it by 20% (terms and conditions apply).